CORVALLIS — Over the past two decades, Oregon State has been fortunate to field a wealth of great running backs. 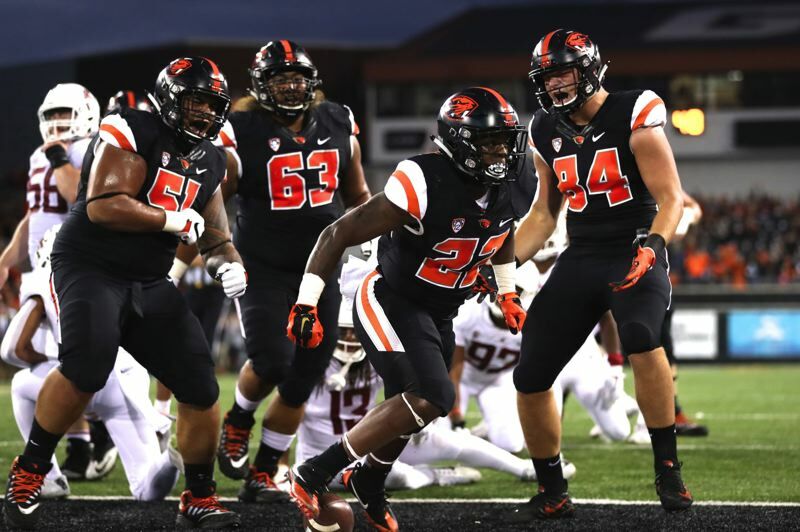 The Beavers' Mount Rushmore at the position — at least in the post-Dee Andros era —began with Ken Simonton and continued with Steven Jackson, Yvenson Bernard and Jacquizz Rodgers, first-team all-Pac-10 selections all. Meet Jermar Jefferson, who has chiseled his place onto the monument with an all-Pac-12-worthy performance this season. The 5-10, 210-pound Southern California native has sprung onto the scene as one of the nation's premier true freshmen this fall, ranking among the national leaders in rushing yardage and touchdowns and giving Jonathan Smith a major boost in his first season as a head coach. Despite having a banner senior season at Narbonne High in Harbor City, Jefferson flew under the recruiting radar, ranked as a three-star by 247 Sports and largely ignored by the major powers. After transferring from Redondo Union in Redondo Beach to Narbonne, Jefferson led the Gauchos to the CIF State 1-A championship last December, with 158 yards and two touchdowns on 28 carries. For the season, he rushed for 1,861 yards (a 9.1 average) and 34 TDs and caught 23 passes for 372 yards and three scores. He was named the CIF Offensive Player of the Year. Jefferson signed with Oregon State in February and made an immediate impact in August training camp, earning the chance to divide time with junior Artavis Pierce. When Pierce went down to an elbow injury in the second game, Jefferson took over and carried 22 times for 238 yards and four scores in a 48-25 win over Southern Utah. Since then, Jefferson has proved he is not only ready for Prime Time, he has been one of the best backs in the Pac-12. With three games left, Jefferson has rushed for 1,092 yards and 12 touchdowns. "Jermar has done a great job of taking advantage of his opportunities," running backs coach Michael Pitre says in a whale of an understatement. Jefferson loves to win, and his first season at Oregon State has been a disappointment in that regard. "I really hate to lose, but I just have to learn how to control my temper about that," he says with a chuckle. "But I'm happy. I'm excited I picked this school. I love it here. Hopefully this program will be up to par pretty soon." Jefferson grew up in several locales within a 20-mile radius in the area south of Los Angeles and north of Long Beach, the son of Herb Jefferson and Tracy Green. Herb, 46, has worked for 19 years for the Los Angeles School District, coaching a variety of sports to middle-school children the last 10. For the past 12 years, he also has worked as a behavior therapist in special education. Tracy, 45, has worked for the past 12 years at a Foshay Learning Center, a public school in Los Angeles and a top feeder school to her alma mater, USC. She teaches English, is cheer coach and school coordinator of AVID, a college preparatory program. Herb lives in Lynwood, three miles from Compton. Tracy lives in Bellflower. Jermar also spent time in high school living with his uncle, Victor Prince, who coached him for three years at Redondo Union. Herb and Victor are brothers. Herb and Tracy never married but were together for 21 years before splitting up in 2011. They have an older son, Jermale, 22, who played one year of football at UC Davis. Jermar's parents have maintained a healthy relationship. "Herb is still my really good friend," Green says. Jermar's Twitter handle is "Munchie1_," and there's a story behind it. "When he was little, I named him 'Mushy,' but when I put him in Pop Warner (football) we changed it to 'Munchie' because he likes to eat," his father says. "God dang, that dude can eat. A lot of people down here don't even know his first name. Everybody calls him 'Munchie.'" Herb was a 5-7, 165-pound wide receiver at Sonoma State who went on to a lengthy career playing semi-pro football as a quarterback. "I'm about 210 now — muscle weight," says Herb, a rapid talker who has a bit of LaVar Ball in him, in a nicer way. "I played semi-pro from 1998 until last year. Jermar always tells me he doesn't want me to retire, but the kids I'm playing with, they're like 22 to 26. But I still feel like I'm in great shape. Who knows? I might end up playing some yet this season." Jermar was born to play football. "His father is a football fanatic," Green says. "Herb lives, eats, breathes football. Jermar had a football in his crib before he was 2 weeks old. When he was 3, 4 years old, his brother was playing and he'd always cry. He'd tell his dad, 'I want to play.' His dad would say, 'You're too little.'" But Jermar wasn't too little to begin learning the game from his father. "He has been coaching me since I was 3," Jermar says. "I got my first football at 3. When I was growing up, we'd have a couple of friends over, and we'd play football on the concrete in the streets. It was great." By the time Jermar was 6, he was in training with his father, who says he focused on "drills and skills." "We always trained hard," Herb says. "As he got older, it was push-ups, sit-ups, catch 300 passes in the street." Though area youths weren't supposed to start Pop Warner football until age 7, Jermar played at age 6. "He was a baby, but the coach put him at running back in the first scrimmage, and he had like 300 yards rushing and five touchdowns," his father says. "I taught Jermar how to be fast. From the start, he was faster than everybody on the team. And he was hitting people. I never taught him that. He was a natural. "From that day on, I told him, 'If you love this game, you have to be the best in every aspect of it. You have to dominate Pop Warner. Then you have to dominate in high school, and then in college. And then you have to go to pros and dominate there. And then you can hang up your gear and say you were one of the best who ever played this game.'" If that seems like a lot of pressure to place on a 6-year-old, Jermar didn't mind. He had high aspirations, too. "When he was about 6 or 7, he wanted to be the best at everything he did," Prince says. "He told me, 'I don't want to work a regular job. I want to play football for a living.' That was his deal." Herb says his son has reached all the goals he set for him so far. "He dominated Pop Warner," the senior Jefferson says. "His last season at Narbonne, they won the state championship. Now he has stepped into the Pac-12, and you see the results. He's doing what his father is asking him to do." Jermar was a two-way star at safety and tailback for three seasons at Redondo before opting to transfer to Narbonne — a football powerhouse — for his senior year. "I wasn't getting highly recruited by the top colleges," he says. "I felt like I needed to play against better competition." His uncle hated to lose him, but understood. "I told him, 'If you think you want to try something else, I'm all for it,'" Prince says. "He wanted to play with better talent, and he did. He became the damn State Player of the Year." During his time at Redondo, Prince pushed his nephew. "I told him, 'You're weak,' as a motivating tool," Prince says. "He was always trying to prove me wrong. But he was always one of the best, if not the best, player on his team. "I was the only coach who ever sat him out of a game because of his grades. I told him if he started getting D's or F's, he'd have to sit out a game. As a sophomore, he got an F, and he sat out a game. It never happened again." Jermar wound up as an honor student at Narbonne, graduating from high school with a 3.2 grade-point average, according to his mother. "Jermar is a high-character kid," Prince says. "He doesn't talk bad about anybody. All of his teammates loved him. He's just a good guy to be around." Jefferson also ran track as a senior at Narbonne. "That was a social sport for me, to get me faster for football," he says. Jefferson wound up winning the district title in the 100 and 200 and finished third in the state meet in both events, running the 100 in 10.6 seconds and the 200 in 21.7. Ironically, the person who first steered Jefferson toward Oregon State is a former Oregon Duck. James Finley was Narbonne's receivers coach and coached a seven-on-seven team on which Jefferson played for two years. "Coach 'Fin' was the first one who put me in focus on Oregon State," Jermar says. Finley was a receiver for the Ducks in 2005 and '06, but he signed out of high school with Oregon State and coach Dennis Erickson. Finley initially didn't qualify academically and greyshirted, living for "nine or 10 months" in Corvallis while working toward completing his academic requirements. Erickson left OSU after the 2002 season to become head coach of the San Francisco 49ers. "I'd gone there because of Coach Erickson, and when he left, I was going to leave, too," Finley says. He played one year of junior-college ball before signing with Oregon, catching 57 passes as a junior in 2005. When Jefferson was under-recruited as a senior at Narbonne, Finley remembered his time in Corvallis. "It's a small college town, and I thought it would a good fit for 'Munchie,' who is laid-back, quiet, reserved," Finley says. Smith had played quarterback at Oregon State from 1998-2001 and was a graduate assistant at the school the next year during the time Finley was living in Corvallis, so they'd become acquainted. After Smith was named head coach at his alma mater, Finley reached out to Smith, who was instantly interested. Finley was an advocate for Jefferson for several reasons. "He never backed down from anything," Finley says. "He loved to compete. His pal was Darien Butler (now starting linebacker as a true freshman for Arizona State), who had played Pop Warner ball with him. Two days a week from January to May, those guys would come from track practice to work out with our seven-on-seven team at the park. They'd do the whole workout. Those two would go at it the whole time, talking stuff at each other, then they'd go home together." Finley was glad Jefferson stuck to his OSU commitment, even when other schools came in late with offers. "I was happy for 'Munchie,'" Finley says. "He's a good kid, and he worked so hard. Lots of kids work hard when you're watching them. It's different when a kid works hard when nobody is around. He does everything the right way, and now it's paying off for him." Jefferson says he was attracted by several things the Beavers had to offer. "I really like the coaching staff, especially Coach Pitre," he says. "He's a great coach. He has taught me a lot of stuff I didn't know. "The school is great here. The place is nice, mellow, not too rowdy like L.A.
"L.A. is kind of disruptive. Here, it's cooled down, a chill type of atmosphere. That's been good for me. A big reason I came to Oregon State was because I knew if I stayed in L.A., I'd be around a lot of friends and probably get in trouble. I wanted to come up here and experience something new." Pitre had met Jefferson while coaching at Montana State in 2017. "I'd recruited him, but he quickly picked up other offers," Pitre says. After Pitre was hired for Smith's OSU staff, he called Jefferson and said, "Hey, remember me?" "We had a good laugh about it," Pitre says. "He's a good kid, awesome to coach. In high school, you could tell he was going to be a good player. You just don't know how quickly he would catch up to the speed of the college game. Jermar has worked really hard learning the playbook, learning our system, working hard off the field. "One of the things that makes him good is he's humble. He wants to be a good teammate. He wants to get better every day. He loves football, loves to practice, loves to compete. He loves his teammates. Doesn't want to let anybody down. That's what you want as a coach." Jefferson is a football junkie. The television is always on to the sport in the dorm room he shares with fellow true freshman running back Kase Rogers. "I always watch football," he says. "A lot of highlights in the morning, afternoon, after school when I come back home." "He's not just a great athlete," his father says. "He's a student of the game. He watches football morning, noon and night if he gets the opportunity. He did that even when he was playing Pop Warner. That's one of the parts. He knows the game." But Jefferson isn't yet a finished product. "The biggest thing for him is to continue to learn the intricacies of pass protection," Pitre says. "At some point, the game's going to slow down for him and he can anticipate what the defense is going to do. It hasn't happened yet. He's still learning (to block). That's what separates good backs from great backs — understanding all the small details that allow you to be really good, and what the line is doing in front of him. I know he'll improve. He wants to be great." His father is certain he'll get there. "I told the coaches at Oregon State, 'You're getting an amazing person and an amazing athlete. You're going to get some amazing stuff out of that young man,'" the senior Jefferson says. "When he signed, he told Coach Smith, 'I'm going to sign with y'all, and I'm going to get those other schools back on the field. I'm thankful for the opportunity to display my talents at Oregon State.' "
Jefferson's first season at OSU has been difficult only because of the record, his father says. "My son doesn't like losing," he says. "It hurts his heart. But a lot of kids are going to want to come play with my son. That's going to help the recruiting, and it's going to help Oregon State. They're going to get some good kids." Mike Riley was the head coach when Simonton, Jackson, Bernard and Rodgers played at Oregon State. "Jermar belongs in the conversation with those guys, for sure," says Riley, now a consultant for the Beavers. "He's kind of in between in terms of style. He has some shake like 'Quizz.' Yvenson was the best at quickness in the hole and was the best inside zone runner. Jermar has another element like Steven — he's really fast. He has strength and speed and good vision. "Those are common qualities in a back — but Jermar is anything but common. He's really good." Bernard works on campus with the OSU Foundation, so Jefferson has become familiar with him. Jermar has met Jackson and Simonton in person and has communicated with Rodgers on Twitter. "It makes me feel good, being talked about with all those legends," Jefferson says. Jefferson has a shot at breaking Jackson's single-season rushing record, but it's not a priority. "That would be fun," he says, "but I'm really just trying to help this team win." Finley predicts great things will happen as Jefferson matures as an athlete. "Once he learns how to lift (weights), his body will change and get more muscle," Finley says. "I watched Steven Jackson tote that thing up there. 'Munchie' is going to go down as one of the best to play up there. He'll be one of the all-time greats in Oregon State history before he's through." His mother will be watching. Green — who had been on one airplane flight in her life before this year — has missed only two games this season, against California and the opener at Ohio State. "I was scheduled to go (to Ohio State)," she says sheepishly, "but I missed my flight. "I'm really stoked," she says. "It has been so much fun. When I go to the games, I don't have any self-control. I'd never been to a college game before, and it's my son, and oh, my goodness. I'm just so happy."